When I was browsing some desert recipes to make for V-day, I liked this one in particular because of the Espresso use in it. I am crazy for coffee, my hubby is in deep love with chocolate, so the mix of these two wonderful ingredients in this recipe resembled the 'made for each otherness' (as our couple) :-). As I am new to make deserts with chocolate I did not dare to experiment, but simply followed the recipe to make chocolate espresso mousse. But When I served this in the Fancy Chocolate Cup I made, it simply looked gorgeous. The Aromatic Coffee flavor adds distinctive flavor to this smooth and rich mousse. Here is the recipe for you, Enjoy! 2. Add the Espresso to the chocolate when it is melting. (Usually I don't brew coffee everyday, we use instant coffee, so I have taken 3 Table spoon water in a cup added 1 spoon of Taster's Choice Instant Coffee powder and microwaved it for 30 sec to 1 min). 3.Add the butter and to the chocolate mixture and mix it well, until it melts. 5. Remove the Chocolate mixture from heat and mix the Yolks and mix it very well and set aside. 6. Whisk the Egg Whites ( you have to use the electric mixture) in a bowl until stiff, but not dry. 7. Fold the Egg whites into chocolate mixture. 8.Transfer this into a bowl and chill for at least 2 to 3 hours. 1. Set Your Fancy Chocolate Cup in a plate. 3. Take one scoop of Chocolate Mousse and set on top (at side angle) of the ice cream. 4. Finally Shave (I have used my peeler) some Milk Chocolate ( to contrast the colors) and sprinkle on top. Ooo La La! Now take a spoon and dig into it. 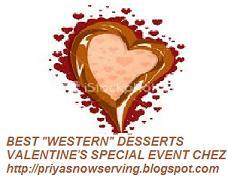 I am sending this entry to Best Western Deserts event at Priya's Now Serving. I am sending this to Reva's A.W.E.D - British Event started by DK's Chef in You. I am sending this to Friday Potluck Party at EKat's Kitchen. Ouch..that looks positively sinful n scrumptious..YUM!! Wow mytheryi, expresso mousse looks so yummy and tempting.. Cool. I am coming over for dessert. Your dessert is beautiful! I would like to invite you to bring a dish to my Full Plate Thursday, the linky is open all week end. Thank you for sharing and have a great day! Awesome chocolate mousse.. I'm a big fan of coffee flavor.. This one is one yum yum recipe!! Gonna try..
Great - you linked it in. Thank you and have a super week.